Funnyman David Cross comes from humble beginnings. Growing up, his family wasn’t very well off and after moving around several times, they settled in Georgia, only to be evicted from their home a few years later. Cross began his career in comedy doing stand-up performances through high school, later joining a sketch group at Boston’s Emerson College. He became a regular act at a club called Catch a Rising Star, which is the same place where some of today’s most popular comedians started, like Robin Williams, Jerry Seinfeld, Ellen DeGeneres, Ray Romano, Eddie Murphy, Jim Carrey, and Chris Rock. While his career as a stand-up comedian continued to thrive, Cook made the transition into television in 1993 by taking on a writer position for the sketch series The Ben Stiller Show. In 2003, Cook joined the cast of the TV comedy Arrested Development, about a dysfunctional American family. A few years later, Cross introduced the world to his girlfriend, actress Amber Tamblyn. They were rumored to be dating for at least a year before stepping out in public together. Everything about their relationship seemed normal—Cross proposed after about three years together, they enjoyed the engagement for a year, and then had a quaint little outdoor wedding ceremony in front of family and friends. But there was one thing that made their marriage just a little less traditional: the 21-year age gap between them. When Cross and Tamblyn got married in August 2011, he was 49 and she was 28. Unlike many other couples who are in age-gap relationships, Cross and Tamblyn don’t play dumb—they know it’s what people are most curious about. And this celebrity couple has no problem talking about it. “I was slow to make any moves because of our age difference, and also because she was a fan,” Cross told the audience when the couple appeared on stage together during the sketch comedy show Running Late with Scott Rogowsky. Vena, J. 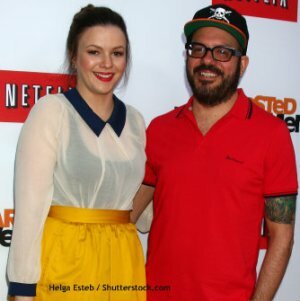 “Amber Tamblyn, David Cross Married,” MTV web site; http://goo.gl/tmifI, last accessed June 20, 2013.